For wine purposes the Sierra Foothills stretch 200 miles north and south along the western slope of the Sierra Nevada. The eastern boundary is definitely geo-political: the contour line at 4,000 feet of elevation is, in most cases, the western border of the US National Forest. Whether or not 4,000 feet of elevation in the Sierra Nevada actually imposes a climatic limitation on grape growing is a separate question. We do not have an answer today. I live at 2,500 feet near Interstate-80. The growers across the street from me only harvest their Syrah grapes five or six years out of ten. Of course they are not a winery (and grapes are not even close to their main business). They could trellis differently for better ripeness, and prune more aggressively. Different varieties would help. There is a commercial vineyard over 11,000 feet high in the Argentine Andes (owned by Donald Hess), but that is in a desert environment at less than 25º of latitude (I’m closer to 38º). On the western slope of the Rocky Mountains, there are successful commercial vineyards in Colorado and in New Mexico at over 6,000 feet of elevation. In the Sierras 3,600 feet is about the record (owned by Madroña Winery in El Dorado County). As a specialty, high-elevation viticulture has not taken off in California just yet. It may be coming, drawing adherents willing to take a risk in exchange for low initial land cost. They will certainly have a large learning curve ~ on the growing side, but also as to winemaking and to marketing. It is one thing to make a wine the market wants. It’s another thing entirely to market the wine your location makes best. Once again, it is imperative to have or to acquire an automobile for visiting Sierra Foothill wineries. There are six main districts plus a couple noteworthy outliers: (from south to north) Calaveras County surrounding the little hamlet of Murphys; Lodi, in the Central Valley just north of Stockton; Amador County surrounding the even smaller hamlet of Plymouth; El Dorado County divided between Fair Play and Camino; and then a large, spread out territory in Placer and Nevada Counties functionally headquartered in Grass Valley, but sprawling west to Lincoln. The outlier districts are a couple wineries in Mariposa County just west of Yosemite Park, and a stupendous auberge a little bit further south at the terminus of Hwy 49 in Oakhurst. Then there is a one-of-a-kind district called Clarksburg in the middle of the Sacramento River. Grapes grow below sea level there in peaty soils with water held out by levees. Finally there are wineries spread out around Sacramento in Yolo County, and on north to Yuba County where one really good one (Clos Saron) and another rather bizarre one (Renaissance) share the little burg of Oregon House. The Foothills are all broken up into separate districts by snow-melt rivers churning out of the Sierra Nevada on their way to join the Sacramento River in the north and the San Joaquin River in the south. Both those rivers in turn flow through the Central Valley from opposite directions into the Delta, and thence to the Pacific Ocean through San Francisco Bay and the Golden Gate. The main road of the Foothills is Hwy 49. One lane each direction, festooned with little towns harking back to the Gold Rush with raised wooden sidewalks, and abundant antique stores peeking out from behind lace curtains in restored rockwall buildings. There will be several Victorian era homes in each town. Not the five-color intricate painted ladies of San Francisco fame, but detailed woodwork on a building with a veranda and a circular tower all the same. Hwy 49 is not a high-speed freeway. It goes through every little town at 25 mph, and winds down into, and back up out of, just about every river canyon imaginable. That’s a 4- or 5-mile trip at 25 mph in each canyon. There are 19 major rivers on the western face of the Sierras, most with two or three forks (read separate canyons). The point is you may be happiest traveling up into each district of the Foothills separately, rather than trying to go from one end to the other on Hwy 49. Calaveras in the south ties together really nice with a trip to Yosemite. El Dorado and Amador, in the middle, link up together quite conveniently. Placer and Nevada Counties are easy visits going or coming from a trip to Lake Tahoe. The schematic map on our next page will help you pick a route. Don’t trust it to give you any sense of distances. Go north and south on I-5 or Hwy 99, and then take off for your anointed destination from either Sacramento or from Stockton. You could come up from Southern California. In which case you need to know about Erna’s Elderberry House in Oakhurst at the southern end of Hwy 49. Erna’s is one of the top two or three Auberge-style wine restaurants and hotels in America. They are on Hwy 41, the southern entrance to Yosemite. There is nothing casual about Erna’s. It will be one of your best meals of the year, and you will not see another wine list its equal for many years. It is fairly expensive, but when you are in the area, you can’t pass up an opportunity to eat at Erna’s. The owner’s daughter (Renee-Nicole Kubin) is the sommelier at Gary Danko in San Francisco. If you eat at Erna’s, you might choose to stay at the Wawona Lodge, just inside the Yosemite Natl. Park entrance. Then, the next day drive out to Glacier Point, before descending into Yosemite Valley. Once on the valley floor, at least have lunch at the Ahwahnee Hotel in their magnificent dining room. Depart to the north on Hwy 120. You should explore Sonora and see Columbia State Park before going on into Murphys on Hwy 4. Eat at the City Hotel in Columbia. It is a cooking school with a very fine wine list. Stay in Murphys so you can take advantage of the opportunity to walk to some 18 different winery Tasting Rooms. Coming from San Francisco or San Jose instead, you would want to get to Stockton, then on the south side of the City Center take Hwy 4 up into the mountains. These districts, and there are four of them (two in El Dorado County), are the heart of the Region. Moreover they can easily be visited sequentially. Placerville, at the intersection of Hwy 50 and Hwy 49, is the northern trailhead. It is both historic and modern. It is the seat of government in El Dorado County, so there are plenty of services, often resident in reconstructed 150-year-old buildings. There are also strip malls west of downtown. The wine district of Camino is functionally synonymous with Placerville, so there are plenty of overnight accommodations and places to eat. But there are not a lot of restaurants, nor motels, nor gas stations in the Fair Play district, which is a half hour of winding road from Placerville, and then another half-hour from Plymouth in the Amador wine district. So some degree of planning is desirable. Just a few minutes up Hwy 50 (uphill would be east) from Placerville is the tiny town of Camino, in a district called Apple Hill. It lies along Carson Rd, parallel to but somewhat north of the freeway that is Hwy 50. Carson Rd drops down through an historic district known 150 years ago as Emigrant Ravine, before re-entering Placerville. Emigrant Ravine was home to the French, Italian, and Swiss miner / farmers who channeled river water for mining purposes and terraced hillsides into attractive garden plots. Historically there was something of a cultural separation between the Europeans and their American rivals who lived along the river in Hangtown (Placerville) proper. Of course you could take Hwy 49 from Placerville directly to Plymouth (center of the wine district) in Amador County. You would, however, miss Fair Play in El Dorado County, and you don’t want to do that. Fair Play is a really cool little district. There are a couple exceptional wineries, which require your attention if you want to be conversant on the best wines in California, and there are many attractive, competent wineries which will show you a real good time. It’s pretty country, and it’s nicely self-contained. You could take a bicycle, and a picnic, and make a wonderful day of it. There are also a couple wineries which have great facilities, whether their wines are exactly your cup of tea or not. The main street in Placerville is Broadway. Exiting the east end of town it changes names to Newtown Rd. Take that to its T-intersection with Pleasant Valley Rd. Turn left. Turn right on Mt. Aukum Rd (pronounced EH kum by locals). Mt. Aukum Rd is also E-16. Just passed Sierra Oaks Estate winery turn left on Fairplay Rd. As you progress along Fairplay Rd, you will notice an opportunity to turn onto Perry Creek Rd. There will be another opportunity to do the same further along. That loop on Perry Creek Rd, plus a section of Fairplay Rd, constitute what I’ve previously described as the Fair Play bicycle circle. (Whether or not the name Fairplay is spelled with a space in it is a matter of controversy. I’m afraid I can’t help you out there.) Fairplay Rd T-intersects with Omo Ranch Rd. A right turn there will take you back to Mt. Aukum at a point where Mt. Aukum Rd changes names to Shenandoah Rd. Stop at any winery for a detailed map. Shenandoah Rd is the main route through Shenandoah Valley, the primary wine district in Amador County. It intersects with Hwy 49 across the street from the little hamlet of Plymouth. Turning left (south) on Hwy 49 will take you to all sorts of services. If, instead, you are bound for Lodi, then very shortly ~ when Hwy 49 takes off sharply to the left ~ you will stay straight, now on Hwy 16, and a few hundred yards later take a left on Hwy 124 toward the little town of Ione. Once you reach Ione stay alert. You want to exit Ione still on Hwy 124 (which is called South Church St on your way out of town). There are three turns involved downtown. Seems excessive, but Hanlon’s Razor tells us: “Never attribute to malice that which is adequately explained by stupidity.” Veer right when you run into Hwy 88. Take Hwy 88 around north side of Comanche Reservoir into Lodi. You’ll not see the reservoir. Do your business. Hwy 88 is called Kettleman Av in Lodi. It has on-ramps for both Hwy 99 and for I-5. If, after seeing Amador, you wanted to return to Sacramento instead of going to Lodi, you would do so by staying on Hwy 16. Take I-80 toward Reno. You will be exiting in a number of places including Loomis, Auburn, and Colfax. You can get onto Hwy 49 in Auburn (which is the Placer County seat, and loaded with services). 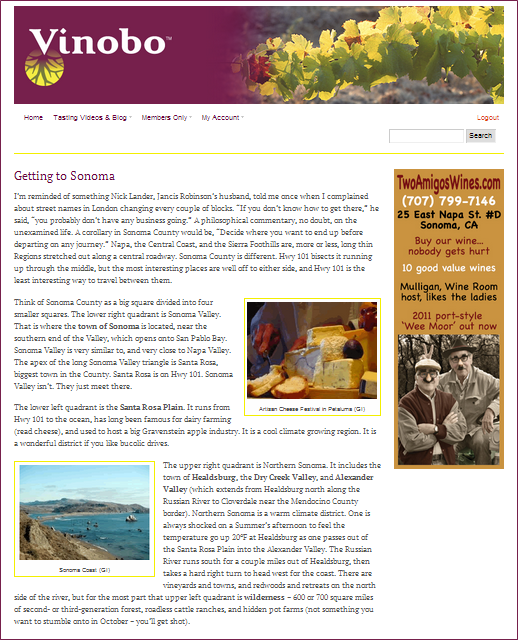 Hwy 49 north to Grass Valley will open up many tasting opportunities. One can easily fly into Reno or to Sacramento. In either instance, one would want to rent a car, then get onto I-80 headed to Auburn, where an intersection with Hwy 49 can be made. There is Amtrack service along I-80 (it’s called the California Zephyr), but the timing is terribly unreliable. Rent a car.